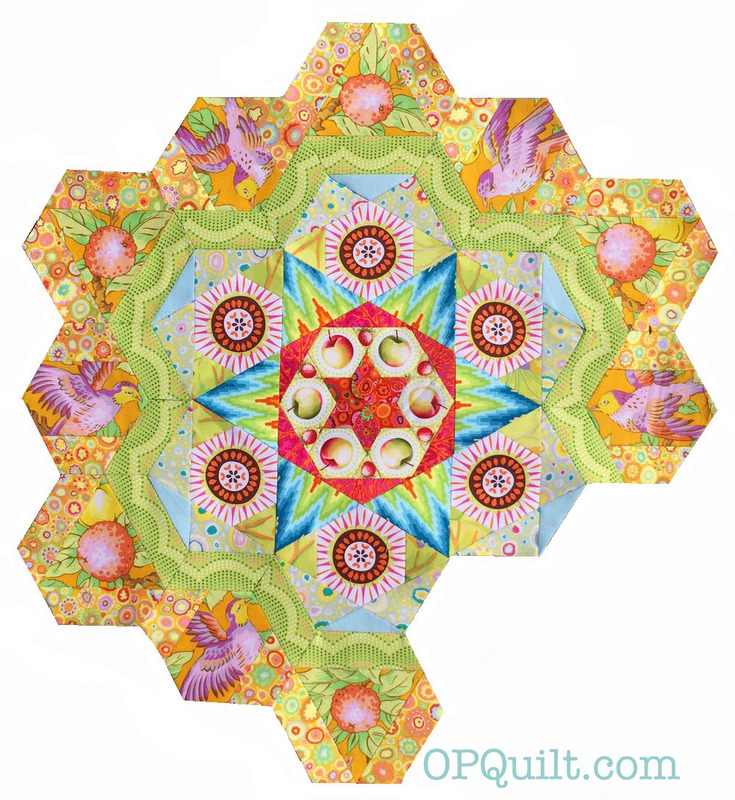 New Hexagon Millefiore Quilt-Along | OccasionalPiece--Quilt! 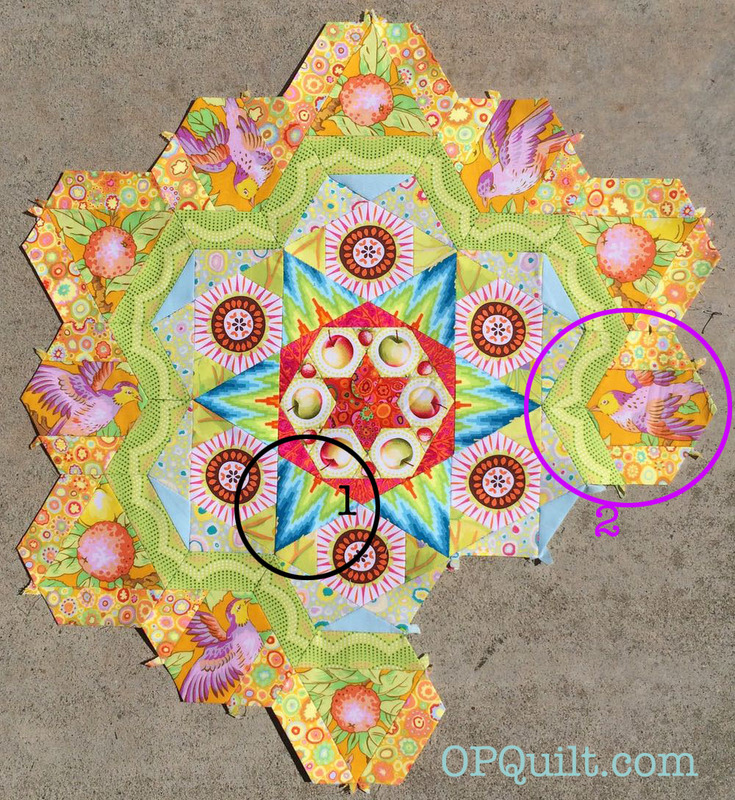 Posted on July 15, 2018 by Elizabeth E.
And with this Rosette (#10b), I finished up The New Hexagon Millefiore Quilt-A-Long. Contractually. At least according to the rules of the The New Hexagon Millefiore Game. But I really hate the crenellated edges. I don’t mind the zig-zag edges on the sides, and have loved what others have done, by appliqueing the quilt down to a solid border. But for this quilt, these colors, every border fabric I chose just looked terrible. Clunky. Admittedly they are kind of wild, but really, the quilt is kind of wild. Instead, I’m try to fill them in. You can see what the first two look like. There are 9 crenelations on the top and 9 on the bottom, so two down, 16 to go. This is actually not as hard as I thought, as the fabric choices have already been made, and it’s just sort of filling in and figuring out how the pieces will work. I am trying not to use just one-fabric half-hexie blocks, but instead, create interesting seamed fill-in pieces. I figure the sides will be faster–just a sort of background fabric from the nearest rosette. This one looks great with the appliqued-to-borders treatment. 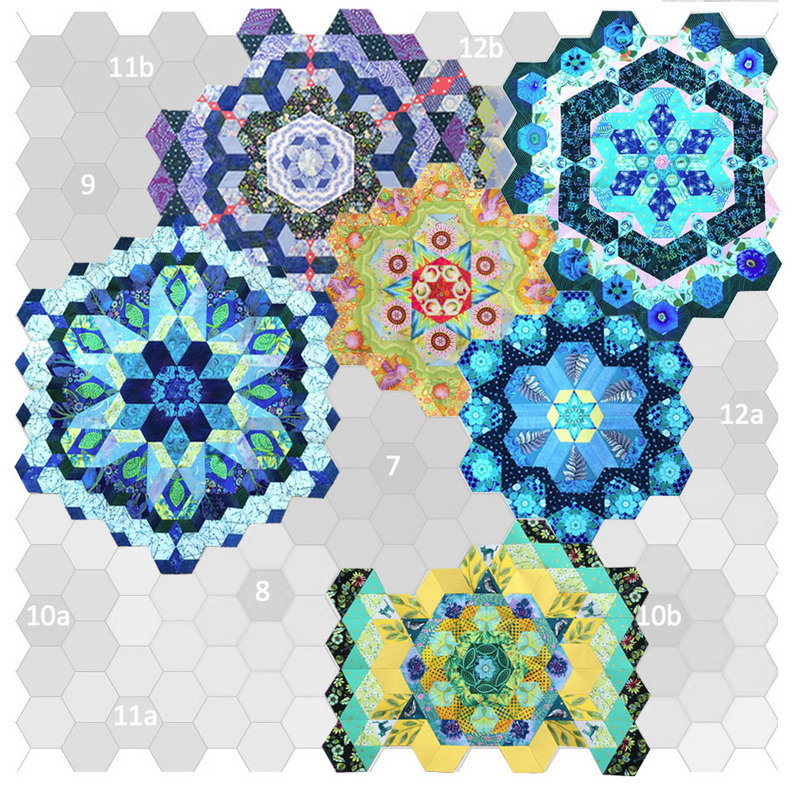 Not technically a Hexagon Millefiore quilt, but those borders! Another that is not a hexagon-based EPP, but I love the way they broke the borders. This one filled in many edges, and moved a lot of the rosettes around. Many of these quilts turned the design on the its side, or upside down. 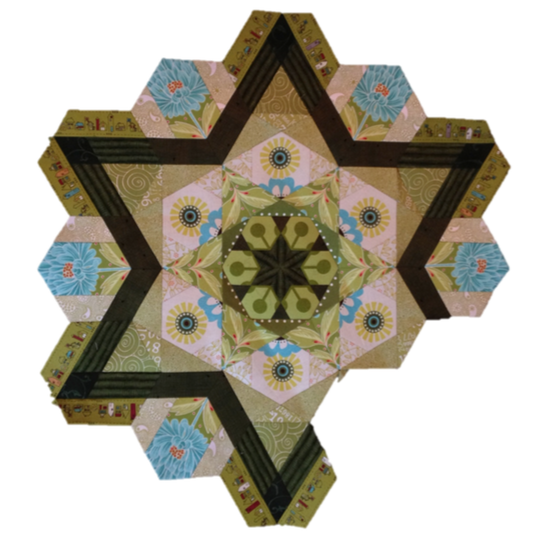 I should note that I also changed the lower edge of mine, melding 4 different rosettes into one gigantor rosette, plus I tweaked a few more places (there is NO star in the middle of my quilt, for example). My leftovers (paper pulled out that was still in good shape). I’m using them to build the edges.